We’d love your help. Let us know what’s wrong with this preview of Prophecy of Ashes by John R. Monteith. Dianne suspects she’s a psychic empath, but when telepathic shocks, ghostly warnings, and secret books suggest an immortal savage is hunting her, she needs to embrace her full abilities–fast. A human wraith is seeking Dianne as a sacrifice, forcing her to partner with strange men who use modern technology and ancient magic t Master your powers or become the next sacrifice. Clive Cussler Society Adventure Writer's Competition Finalist and bestselling author John Monteith brings you this thriller that blends supernatural, metaphysical, and paranormal elements in one page-turning adventure. To ask other readers questions about Prophecy of Ashes, please sign up. This story develops around the groups before they all merge. There are wraith hunters who hunt every 50 years. Diane a woman who believes she's an empath and the wraith who is a psychopath. There are thrills and suspense but I have to admit I didn't really like Diane. She was kind of whiney through most of the story and I wished the wraith would have tortured her. On the other hand there was enough elements to keep me listening. One of them was wondering when the wraith was gonna kill her and ho This story develops around the groups before they all merge. There are wraith hunters who hunt every 50 years. Diane a woman who believes she's an empath and the wraith who is a psychopath. There are thrills and suspense but I have to admit I didn't really like Diane. She was kind of whiney through most of the story and I wished the wraith would have tortured her. On the other hand there was enough elements to keep me listening. One of them was wondering when the wraith was gonna kill her and how he'd do it. Would it be bloody and quick or slow and painful? PROPHECY OF ASHES is meticulously plotted so that at key moments a new twist is revealed and that twist neatly answers questions readers had earlier in the story. If Author John Monteith has created a new book series. I thoroughly enjoyed reading it and getting to know the main characters. 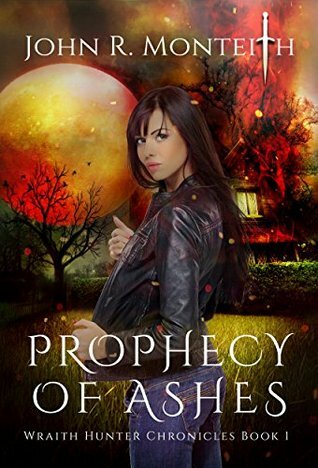 PROPHECY OF ASHES is meticulously plotted so that at key moments a new twist is revealed and that twist neatly answers questions readers had earlier in the story. If I sound cryptic, it is only because I do not want to give anything away that would ruin the next readers experience with "Prophecy of Ashes." I use the word "experience" above and that is exactly what this book is - an experience. You don't just read it, you dive into it. The author skillfully takes the reader on a journey that made me think of Dan Brown's novel, The DaVinci Code. The concept of 'Good versus Evil' has been around since humans began walking upright. It is used repeatedly in both film and literature. Sometimes the concept works, and sometimes it does not. In PROPHECY OF ASHES, IT WORKS!!! Monteith proved to me that it is the writer, not the material, that makes the story. I have been a big fan of Monteith's "Rogue" series for years, but when I saw that he had an offering in the supernatural genre, I was lukewarm. Those type of stories have just never been my thing, but on a whim I picked it up, and I couldn't put it down. In quick summary, two Irish men, father and adopted son, are part of a an ancient order charged with killing wraiths, which are demonic, possessed humans who per Monteith proved to me that it is the writer, not the material, that makes the story. I have been a big fan of Monteith's "Rogue" series for years, but when I saw that he had an offering in the supernatural genre, I was lukewarm. Those type of stories have just never been my thing, but on a whim I picked it up, and I couldn't put it down. In quick summary, two Irish men, father and adopted son, are part of a an ancient order charged with killing wraiths, which are demonic, possessed humans who perform ritual killings to remain immortal. The deck is stacked woefully against the hunters, and they only get a chance every fifty years for a kill, but Liam and his father Connor plan to make the most out of every clue. Throw in a beautiful virgin named Dianne, her autistic brother Josh, and just for good measure her born-with-no-filter grandmother, and you have a hell of a story. Doing tarot readings to earn extra money, Diane suspects that she has psychic abilities. When her special-needs brother, Josh, tells her that she does not need the tarot cards, she’s loathe to believe him, until she’s visited by the ghost of a young woman who informs her that she comes from a long line of witches. When she’s kidnapped by Jacob, a wraith who has engaged in a cycle of murder and theft of life from a virgin every fifty years for hundreds of years, she must quickly master her new ab Doing tarot readings to earn extra money, Diane suspects that she has psychic abilities. When her special-needs brother, Josh, tells her that she does not need the tarot cards, she’s loathe to believe him, until she’s visited by the ghost of a young woman who informs her that she comes from a long line of witches. When she’s kidnapped by Jacob, a wraith who has engaged in a cycle of murder and theft of life from a virgin every fifty years for hundreds of years, she must quickly master her new abilities, or die. Her quest is added by the father-son team of Connor and Liam, bounty hunters from an ancient order whose mission is to find and destroy wraiths, her Nana, and a young nursing student who also has psychic powers.